The K2 Summit 3G Production Client is optimized for a broad range of production and broadcast applications and is the only server that supports end-to-end SD/HD workflows in DVCPRO, MPEG-2, AVC-Intra and H.264/AVCHD formats. With bidirectional channel control, you can quickly switch between record and play. Individual channels can be software configured for additional functions as well as the creation of low-resolution streams and proxy, making the the K2 Summit 3G Production Client the most versatile server available. K2 Summit 3G media servers are now available with IP I/Os for SMPTE 2022-6 connectivity, either installed at the factory or as a field upgrade kit. See the K2 Summit IP I/O webpage for more information. * Time for video with four 16-bit audio channels, no ancillary data. Times are estimated and can vary by ±10%. K2 Summit 3G Production Client – 2 RU platform with 2 bidirectional HD/SD channels. Supports DV, DVCPRO, DVCPRO 50, DVCPRO HD and HD/SD MPEG-2 record and agile playback of DV, DVCPRO, DVCPRO 50, DVCPRO HD and HD/SD MPEG-2 playback. Connects to shared storage via iSCSI over Ethernet or using optional 8 Gb/s Fibre Channel or can be configured with internal SAS storage. Includes dual hot-swappable power supplies, hot-swappable fans, and AppCenter control and configuration application. K2 Summit 3G Production Client – 2 RU platform with 4 bidirectional HD/SD channels. Supports DV, DVCPRO, DVCPRO 50, DVCPRO HD and HD/SD MPEG-2 record and agile playback of DV, DVCPRO, DVCPRO 50, DVCPRO HD,and HD/SD MPEG-2 playback. Connects to shared storage via iSCSI over Ethernet or using optional 8 Gb/s Fibre Channel or can be configured with internal SAS storage. Includes dual hot-swappable power supplies, hot-swappable fans, and K2 AppCenter control and configuration application. K2 Summit iSCSI connection to the K2 SAN through Gigabit Ethernet. K2 Summit client Fibre Channel connection to K2 direct attached storage. Includes dual-port 8 Gb/s Fibre Channel host bus adapter. K2 Summit single client Fibre Channel connection to K2 SAN storage. Includes dual-port 8 Gb/s Fibre Channel host bus adapter. K2 Summit 3G internal media storage, includes 12 x 600 GB SAS media drives and RAID controller. Configured as RAID‑0 (12 data/no parity). Select one internal media storage option only. K2 Summit 3G internal media storage, includes 12 x 600 GB SAS media drives and RAID controller. Configured as RAID‑1 (6 data/6 parity). Select one internal media storage option only. K2 Summit 3G internal media storage, includes 12 x 900 GB SAS media drives and RAID controller. Configured as RAID‑0 (12 data/no parity). Select one internal media storage option only. K2 Summit 3G internal media storage, includes 12 x 900 GB SAS media drives and RAID controller. Configured as RAID‑1 (6 data/6 parity). Select one internal media storage option only. K2 Summit 3G 2-channel AVC-Intra codec and H.264 playback license. Includes AVC-Intra level 50 and 100 and encoding and decoding and H.264 L4.2 AVCHD playback. Two required for 4-channel model (K2‑XDP2-04) Factory installed. K2 Summit 3G MPEG-2 multicam encoding factory option. Adds the ability to record up to 4 video streams per codec module using MPEG-2 compression when used in ChannelFlex mode. Includes hardware and additional MPEG encoding license. Two K2-XDP2-MPG2 options are required for the K2-XDP2-04 and enables up to 8 video streams to be recorded. Also requires factory installed AppCenter Elite license (see K2- APPCTNR-ELTE-FO below). K2 Summit 3G DNxHD license. Includes DNxHD encoding and decoding. Two required for 4-channel model (K2‑XDP2-04). Factory installed. K2 Summit Client dual port RJ-45 copper Ethernet 10 GigE host adapter card. Adds 10 GigE connectivity to K2 Summit Client. Factory install. K2 software application synchronizes two K2 standalone file systems. K2 AppCenter Pro for the K2 Summit Platform extends the feature set of standard AppCenter and includes such features as audio track tagging, super out and proxy encoding licenses for 4 channels of low-resolution proxy generation. Factory installed. K2 AppCenter Elite for the K2 Summit Platform extends the feature set of standard AppCenter and includes all AppCenter Pro features plus ChannelFlex and proxy encoding licenses for 8 channels of low-resolution proxy generation. ChannelFlex includes 2X and 3X super slo-mo record, key plus fill record and play, and multicam recording. Factory installed. Flexible Media Framework HTTP Protocol. Adds legacy K2 Central connectivity to K2 Summit Client. Factory install. K2 Summit 3G client, spare power supply. K2 Summit 3G client, spare codec module. K2 Summit 3G client, spare controller module. K2 Summit AES DB25 to XLR break-out cable set, 2 cables per set. Provides 4 each AES XLR connectors for 8 discrete inputs and 4 each XLR AES connectors for 8 discrete outputs. K2 AppCenter Pro for the K2 Summit Platform extends the feature set of standard AppCenter and includes such features as audio track tagging and proxy encoding licenses for 4 channels of low-resolution proxy generation. Field kit. K2 AppCenter Elite for the K2 Summit Platform extends the feature set of standard AppCenter and includes all AppCenter Pro features plus ChannelFlex and Proxy encoding licenses for 8 channels of low-resolution proxy generation. ChannelFlex includes 2X and 3X super slo-mo record, key plus fill record and play, and multicam recording. Field kit. K2 Summit 3G 2-channel AVC-Intra codec and H.264 playback license. Includes AVC-Intra level 50 and 100 and encoding and decoding and H.264 L4.2 playback. Two required for 4-channel model (K2‑XDP2-04). Field kit. K2 Summit 3G MPEG-2 multicam encoding field kit. Adds the ability to record up to 4 video streams per codec module using MPEG-2 compression when used in ChannelFlex mode. Includes hardware and additional MPEG encoding license. Two K2-XDP2-MPG2-FK kits are required for the K2-XDP2-04 and enables up to 8 video streams to be recorded. Also requires AppCenter Elite license (see K2-APPCTNR-ELTE-FK above). K2 Summit 3G DNxHD license. Includes DNxHD encoding and decoding. Two required for 4-channel model (K2‑XDP2-04). Field kit. K2 Summit Client dual port RJ-45 copper Ethernet 10 GigE host adapter card. Adds 10 GigE connectivity to K2 Summit Client. Field kit. 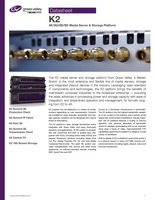 The K2 media server and storage platform from Grass Valley, a Belden Brand, is the most extensive and flexible line of media servers, storage and integrated playout devices in the industry. Leveraging open-standard IT components and technologies, the K2 platform brings the benefits of mainstream computer industries to the broadcast enterprise  including the latest advances in processing power and storage capacity with ease of integration, and streamlined operation and management, for formats ranging from SD to 4K. The K2 Summit 3G+ Production Client is optimized for a broad range of production and broadcast applications and is the only server that supports end-to-end SD/HD/3G/4K UHD workflows in DVCPRO, MPEG-2, AVC-Intra, H.264/AVCHD, DNxHD and ProRes formats. The K2 Summit 3G+ Production Client is a 2 RU platform with redundant hot-swappable power supplies, as well as redundant Ethernet ports. Included with the 3G+ is a new modern OS, Windows 10, that providers users with a more reliable, modern day operating system. To this architecture Grass Valley has added its Emmy® Award-winning core video technology. Each channel is built around a high-performance RISC processor, an embedded real-time operating system, and performs video/audio processing in the robust and secure manner needed for a 24/7, frame-accurate environment. The question is not Is 4K in my future? The question is When must I be ready to compete in a 4K media world? produce 4K now to tell better stories that capture viewers and keep them glued to the action.